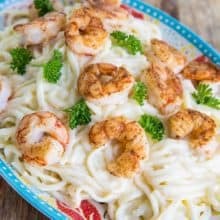 How to make amazing shrimp alfredo! Pan fried shrimp in a creamy garlic Parmesan sauce is perfection for on top of fettuccine! Cook the noodles in a large pot of salted boiling water until they are al dente, around 5-6 minutes. For dry pasta, follow the package instructions. Combine the butter and minced garlic in a large skillet. Fry the garlic for 2-3 minutes until fragrant. Add in the whipping cream and then bring to a low simmer. Simmer for 5 minutes or so, reducing the liquid. Add in the Parmesan, tossing until it’s melted in completely. Cook until the sauce reduces to your liking, then add in the cooked, drained fettuccine noodles. Simmer for another 2-3 minutes to warm the pasta and cook it slightly further. When it’s almost done, sprinkle the shrimp with the seasoning and then fry the shrimp quickly in a small frying pan until pink all the way through. Shrimp cook in around 4-5 minutes. To plate, place the a sauce covered noodles on the plate and top with shrimp.